It’s been a few weeks since we offered readers a full-boogie, top-of-the-line 6mm BR competition rifle. This week we’re proud to feature “Chantilly”, a Stolle-actioned 6BR built by Darrell Jones “with a little help from his friends.” Not just a pretty face, Chantilly has proven herself in competition, with victories in 600-yard F-class contests. Darrell, who owns several 6BRs, is justifiably proud of this handsome, match-winning gun. Darrell tells us, “Chantilly was first conceived by purchasing a previously-owned McMillan BR stock from the Internet for $50.00. The stock was very rough, and had been inletted for a Stolle Panda RBLP. The stock, finished in a dull brown paint, had to be the ugliest that I had ever seen. As you can see, she now wears a handsome silver metallic with 5 coats of clear. My son gave me the custom-mixed PPG paint and I did the work myself in my garage using an airbrush. I also re-inletted the stock and pillar-bedded the action. All up, the gun weighs 18 pounds, with four pounds of extra weight in the rear to help balance out the 30” barrel. From Kelbly’s, I ordered a new polished Stolle Panda RBLP action (.308 bolt face), a polished trigger guard, and a sweet set of 30mm polished rings. Naturally, a Jewell trigger rounded out the fire control group. I decided to order a custom reamer from Dave Kiff at Pacific Tool & Gauge. They’ve always provided good products and quick service for me. I gave Dave a call, and he asked, “What are you going to shoot.” I replied 6mm BR with 107 Sierra MK. I told him I only wanted to clean the necks up on Lapua brass. He suggested a .269″ neck, and he knew exactly the throat I’d need. The reamer arrived in three weeks. The barrel on Chantilly is a Black Star. I purchased it from a friend that had owned it for several years and never used it. It was a 30″ straight 1.260″ contour unfinished in the true rough. The barrel looked liked sheets of metal rolled up into a straight tube. 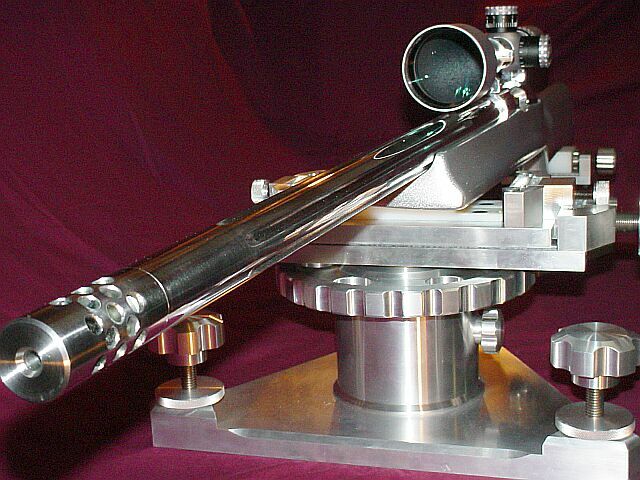 It was marked on the chamber end “6mm 8 twist”. I had never seen a barrel come in this condition. A friend at our local shooting club turned it for me into the current 1.25″ diameter for 5″ tapering to 1.10″ at the muzzle. A muzzle brake was added but not used during competition. I found the muzzle brake is not really that necessary with an 18-lb 6BR. Some F-Class matches also do not allow them for competition. 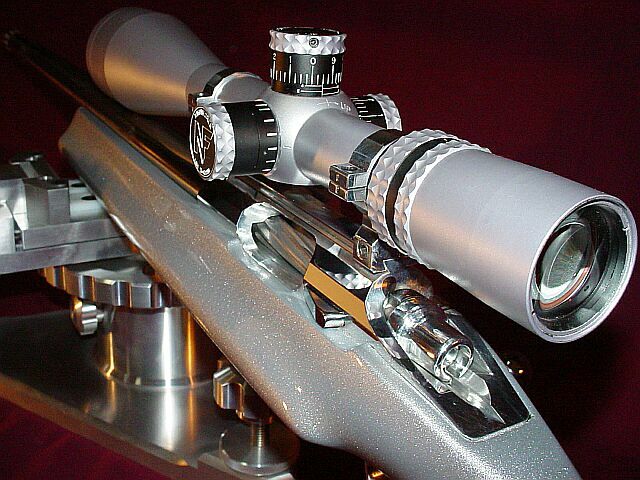 The Nightforce NXS Extreme 12-42×56 with NP-2 reticle was the challenge. I wanted a silver scope. I spoke with Jeff at Nightforce to ask if there was any way that they could special build me one. His response was negative but he hinted that they could possibly do something if I bought direct with them. However, he eventually declined when pressed. Since I already had the scope, I asked some of my friends on another web site where I could have one refinished and was told Spradlin’s in Colorado. I called Jim at Spradlin’s and he informed me he worked on many brands of scopes including Leupold and maintained their warranty. He assured me he could handle the job. I sent the scope along with a check for $100.00 and received the NXS back in three weeks finished as you now see it. 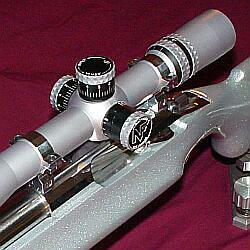 I was very pleased with the silver coating and Jim’s work exceeded my expectations. Blakflag@aol.com. His work is impeccable, made with precision by a perfectionist. You can observe the detail that he puts in all his work. You’ll never see anything but the highest quality from Jerry. He is a true artist with metal. How does she shoot? Remarkably well I must admit. I shoot with a light grip, and the McMillan stock works well for this shooting style. 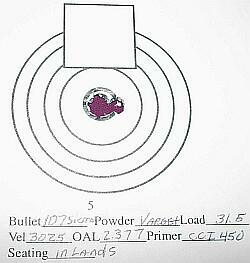 At our club, we shoot 600-yard F-Class using the 20 shot for score method in 20 minutes. A perfect score would be 200 points with 20 X’s. “Chantilly” won her first match shooting a 200 with 10 X’s and won her second match with a 200 with 12 X’s. The 600-yard X-ring measures 3.0″. As you can see from this 100-yard target, she is a real “Hummer”. For the next 6BR project, what might I do differently? 1. I would like to try a Shehane Tracker MBR stock for F-Class. 2. I would buy a 30″ Broughton barrel with their new 5C rifling. 3. I would consider using a fluted, polished barrel block. 4. I would leave off the muzzle brake. 5. I would use a Nesika polished RBLP action. 6. 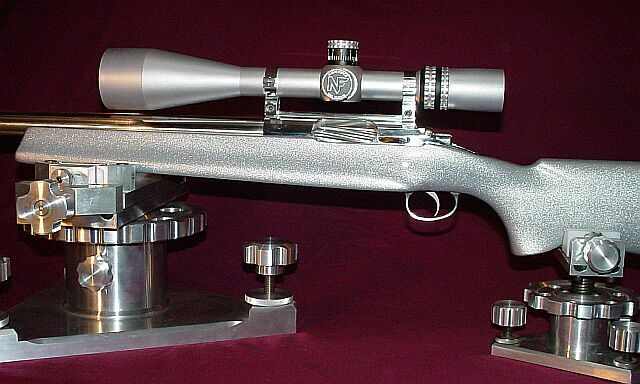 I would probably use a Weaver T-36 silver scope–1/8 MOA clicks and Weavers track wonderfully. I hope you enjoyed reading this report. I’m happy to answer any questions you may have about the project or my load development via E-Mail.